If you can see this, your browser doesn't understand IFRAME. However, we'll still direct link you to the file. 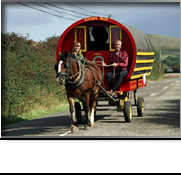 Kilvahan Horsedrawn Caravans is located in Coolrain, just off the N7. To get to Kilvahan, travel on the N7 and between Mountrath and Castletown take the turn for Coolrain village. Continue straight past Coolrain village leaving the Schoolhouse Restaurant on your left hand side. Kilvahan Horsedrawn caravans is on the left after 1 km.